Rather, a better description would be all over the board. Some rave about SBA’s 7(a) cloud computing processing and documentation platform, some are non-committal, and a few think it horrid. As always, this is unscientific, but thanks to the 34 beta testers who offer their feedback to the industry. It’s a great platform for all experience levels, from well seasoned veterans to brand new loan processors. Once you get in the swing, it takes maybe 10-15 minutes longer to apply for a GP# than using etran directly, but because it will create the documents, it’s worth the time investment. The support team for SBA One has been very helpful and eager to hear feedback/create solutions. I’ve ran into quite a few snags along the road, but I’m sure that MOST issues will be resolved prior to becoming live to everyone. 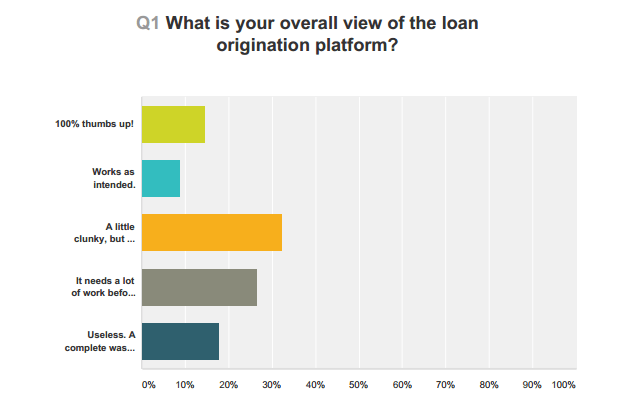 As with any new program, there are bound to be hiccups and improvements needed, but I believe SBA One will help many lenders. We have been testing and it will be great once the bugs are all worked out. Too much time and work. It isn’t completely functional. repeats steps of the credit memo. Like death by a thousand paper cuts. 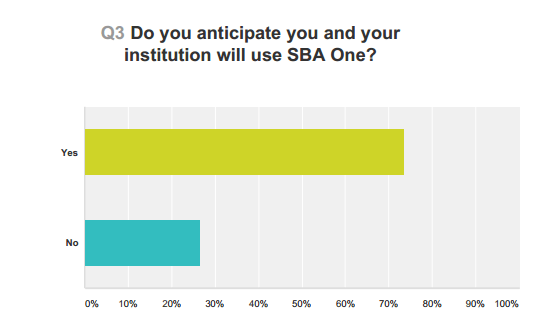 SBA must make integration with Bank Software a priority. Entering each loan twice is inefficient and costly. We need to be able to enter 2 loans at the same time without double entry. The SBA and federal government should stay away from technology projects. Many process flow errors and time wasters which could have been easily avoided if it had been built by someone who actually does loans and cares about how long they take, compared to bureaucrats who are the type of people who only care that there is eight hours of work to do each day. I think that over time, the program will be more helpful as more and more of the functions roll out. Right now, you can’t produce the credit memo, even though is give the impression that you can, and it can’t produce the authorization. 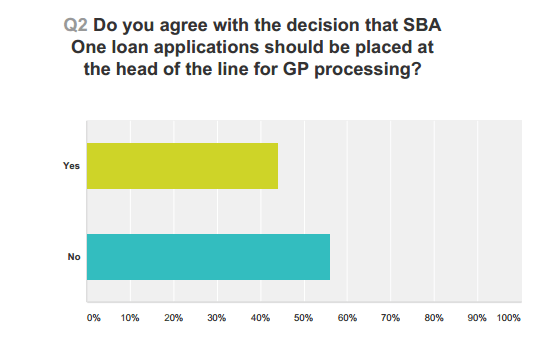 I was disappointed that I can not produce various SBA forms in paper form with only partially completed answers. It is an all or nothing situation, and many times when I am producing forms, I only know have the answers. Since my bank does not yet accept electronic signatures, RAPID is of no use to me. That means that I still have to go out to the SBA’s website and produce the applications documents, one by one. This is not saving me any time. On the other hand, I do love the database function and the ability to upload documents. If I need to liquidate a loan in the future, all of my documents are there waiting for me. As with anything- there is a learning curve. It is unfortunate that SBA did not solicit much input from “would be users” however I believe that eventually they will get it right. E-Tran took years and we should expect the same with SBA One. They are headed in the right direction, but need work on the execution. We are a moderate-volume PLP lender. Program really geared for low-volume, occasional users of programs. We haven’t used it in a few weeks, but SBA One throws out roadblocks that aren’t necessary. For example, emails addresses are (at last glance) necessary to move forward with SBA One, whereas they would not be using E-Tran. Also, the credit score button wasn’t working properly, and there are a few other glitches. In summary, we have confidence SBA will eventually get it right, but it isn’t there yet.